It's amazing what you can do with a dancer, a screen and eerie lighting. 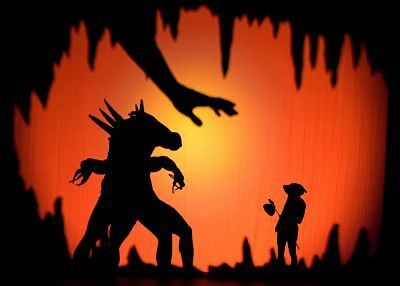 Shadowland, a haunting, hypnotic phantasmagoria, now at NYU's Skirball Center for the Performing Arts, is a triumph of ingenuity. It is performed by Pilobolus, a collective that prides itself on finding dynamic ways to use the human body and work across creative disciplines. Shadowland, the creation of Steven Banks, Robby Barnett, Renee Jaworski, Matt Kent, Itamar Kubovy and Michael Tracy, has been widely seen abroad; this is its U.S. premiere. Dance lovers, as well as anyone intrigued by the power of form, will be captivated. A teenage girl (a wonderful Heather Jeane Favretto) falls asleep and suddenly, the walls of her room spin and she's transported to a land of shadows. Like all dreams/nightmares, she's trapped in a weird journey of distorted images and figures, both humorous and frightening. The revelation is how the figures reconfigure themselves into an array of elements, trees -- pots, hills, animals -- all rendered in fantastical style. Much of the action is done behind a screen with colorful lights, hence the shadows. But what acrobatic shadows! The beauty of movement, especially in evil scenarios, is wildly creative. Neil Peter Jampolis' lighting design, Shane Mongar's technical production and David Poe's original music are excellent. But it is the talented ensemble of dancers -- Shawn Fitzgerald Ahern, Antoine Banks-Sullivan, Krystal Butler, Benjamin Coalter, Jordan Kriston, Derion Loman, Sayer Mansfield and Mike Tyus -- who astound. There is also great pleasure in watching two theatrical heavyweights duke it out, even if the play they spar in is lightweight, humorous fare. 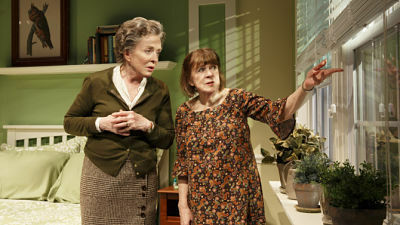 In Ripcord, now off-Broadway at City Center, the setting is an assisted-living facility, where two seniors, in Odd Couple-style, do battle. Acerbic Abby (Holland Taylor), a well-dressed isolationist who hates sharing her room, is housed with Marilyn (Marylouise Burke), an impish pixie whose effusiveness is initially sweet, but as Abby eventually dubs it, "diabolical." Abby wants Marilyn to take a single room on the ground floor, while Marilyn merely wants Abby's bed, which is closer to the window and a park view. So they make a bet. If Abby can make Marilyn angry, an emotion she claims to have dispensed with, Abby gets her single. Conversely, Marilyn has to scare Abby, who claims death doesn't frighten her. "I'd welcome it most days," she says. As the psychic combat ratchets up, the exchange seems to electrify them. "This is way better than bingo," Marilyn's daughter (Rachel Dratch) observes, while dragging her reluctant husband (Daoud Heidami) into the act. Of course, playwright David Lindsay-Abaire, whose last play, Good People took a serious, heartbreaking look at what fate thrusts upon us, has opted here to pleasantly entertain, rather than challenge his audience. He does, however, make some interesting observations about age. Abby, for instance, has lost her sense of taste. That palpable disconnect underscores larger losses, in particular, a taste for friendship or community. Marilyn boasts a breezy, energetic personality, but what lies behind such incessant cheerfulness? Sure, there are some predictable sitcom moments, but they are funny. As directed by David Hyde Pierce, Ripcord shows age doesn't wither invective. And it pushes each lead's specific talent. No one can deliver a snobbish aside better than Taylor, while Burke's zippy simplicity hides canniness. "Why can't people be peculiar anymore?" Marilyn asks. They can. The daring duo may only fight among themselves in Ripcord, but it's worth parachuting into City Center to see the results.